Today we are in the midst of a winter storm ( how ironic) and I am packing for our week of skiing in Quebec. I hope it will be decent enough to travel tomorrow. It is about a 6-7 hour drive. Packing involves not only all the usual attire for day and night, but also ski attire. On top of that we take all our meals, most of which are resting in a cooler inside my freezer. I still have to do some fruit and veggies though, and finish washing clothes. I will thus be away from my blog for at least a week. 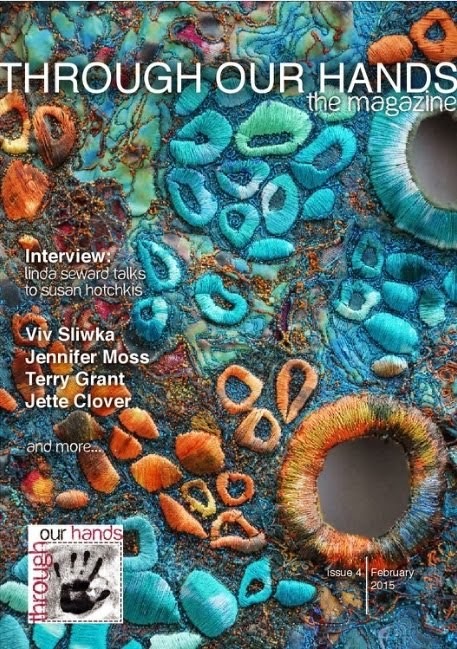 I thought I would show my hand quilting again though, as I would appreciate any input. 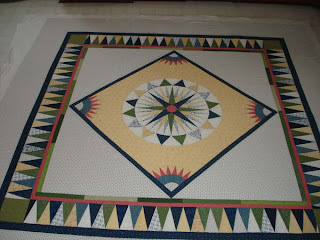 The center medallion which has the Mariner's compass is almost finished, and I'm thinking about the four corner sections with the white print on the outside of that. My plan is to use a fine navy blue pearl cotton and a straight stitch. 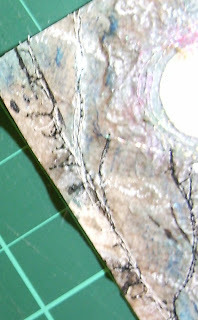 I'm thinking of a lighthouse in each corner with meandering stars all around. Another option might be a seahorse, but then what to fill in with? What do you think? I may possibly take it with me, but I know in the past that the car is usually ridiculously full, so maybe not. It was supposed to be my yoga night with my husband to-night, but I begged off as I was feeling unwell after work. I mixed up a quick batch of guacamole--basically mashed avocado, diced tomato, seasoning and lime and ate it with baked nachos--great supper. I rested while watching Canada win a gold medal in the women's ski cross. That got my adrenaline going! I finished the last little bit of free motion quilting on my little art quilt. It's still not finished; I want to add some more embroidered bushes and some beads. I laid a couple of blues in behind to test for the binding. 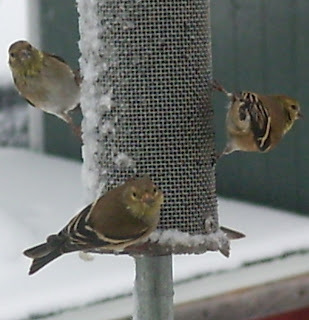 Aren't these goldfinches cute? I caught them on Sunday afternoon at my deck feeder. As people with Addison's must do regularly, I am resting this weekend as well as packing for our March break ski trip to Stoneham, Quebec. We have rented a studio apartment right on the mountain, and we will take all of our meals with us. Yesterday, I packed a cooler of frozen dinners which I'll leave in the freezer. This morning I made some hearty muffins and a leek and potatoe soup to take as well. I wonder if I'll ever learn that I must always carry a camera! I needed milk earlier, and I decided to walk to the store. Once outside, I headed off on my usual route, but then I detoured into the woods trail that I love. It is a wet kind of dreary day here, but mild. 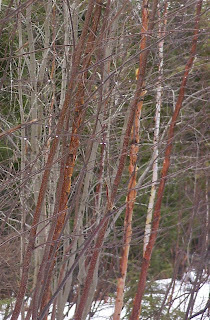 A light snow was falling and there were water droplets hanging from all the small tree branches. They were sparkling despite the lack of sunshine, resembling tiny fairy lights. This kind of beauty really brings me peace. I slowly and mindfully continued to the store. When I got home, I grabbed the camera and drove back to the trail because I just had to try to get some pictures. The droplets were still there sparkling, and I took several pictures. I was not able to capture the real beauty of the moment, since I'm not the best photographer--is it me or the camera?--but you can get the idea. Well, you can see the droplets, but not the ones in the distance. 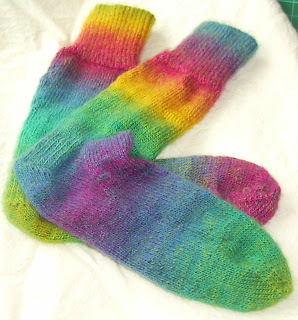 The last thing I've done this week end was to finish up a pair of socks, again while watching the Olympics. 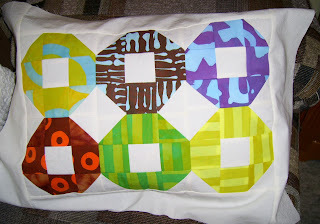 I'm still hoping to take some time to get to the sewing machine later today to finish a samll quilt. We shall see. For now here are the socks. 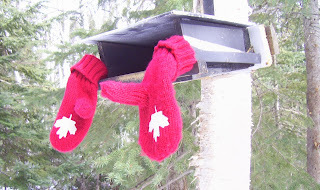 They're done with Wisdom Yarns, Poems Sock. I've had a very busy week at work. It will be the end of the month next week and then our March break starts. I have 2 students who will transfer from my class to the college to continue with their 10, 11, 12. We've been trying to finish up all their testing and get all the reports done. Also, I attended interviews for a new teacher to be hired to start another class. Adult upgrading is experiencing an influx of students. 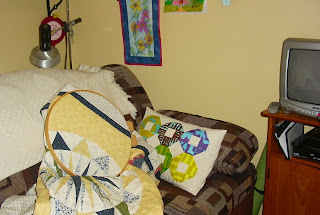 I've been sitting in my studio (pictured at left) curled up on the love seat, hand quilting and watching the Olympics. It's been very cozy and relaxing, but not conducive for pictures. I'm spending the week end at home. 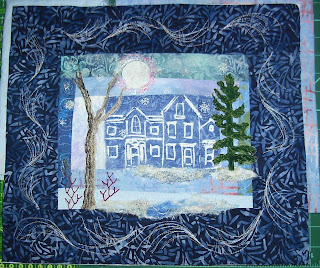 I do have some cooking, cleaning, errand type things to do, and I will be starting to pack for our March break trip, but I'm also hoping to finish quilting a small art quilt. If so I'll have a picture. Today we finally made up to Sugarloaf, NB. It was only our second time out on the slopes this year, and it will be our last until we go away for the March break in two weeks time. Boy am I out of shape! I can hardly keep my eyes open right now. I was awake unable to sleep around 5:00 this morning though, so I made a tea and read some. We left the house around 8:15; it takes about an hour to get there, and the lift doesn't open until 10:00. We had heard about a clearance sale at the ski shop and we were able to buy ourselves helmets-- something we've been wanting to get for a while. Now we'll have them to ski at Stoneham, Que. on the break. When I came home I put one of my frozen lasagnas in the oven and I came into my sewing room. 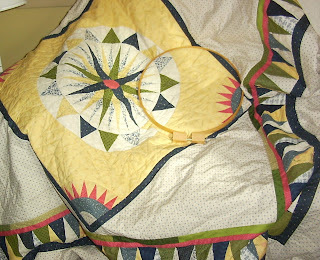 That's when I decided to pull this quilt that I had started to hand quilt last year out of the closet. The center is a Mariner's Compass that I did by hand after a one day work shop several years ago. I then designed the rest of the quilt and finished it by machine. 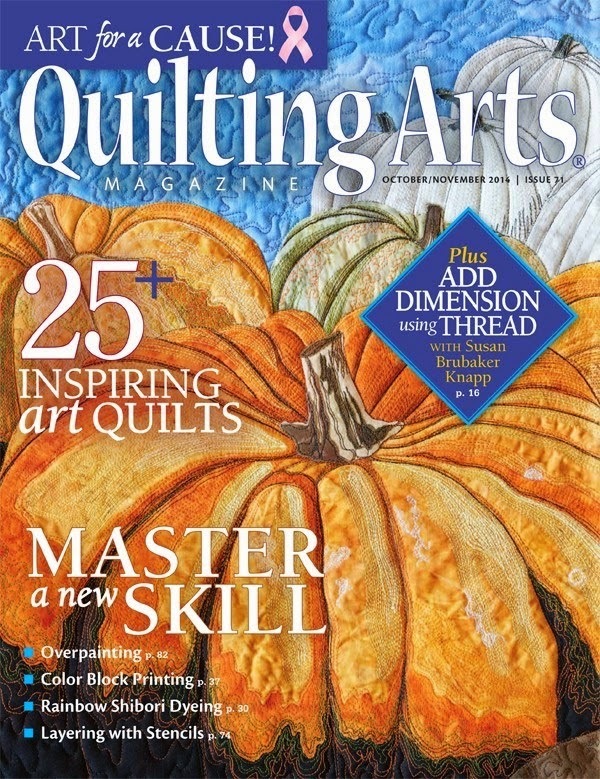 I've decided to hand quilt the areas that are hand sewn, and I may finish with some machine quilting. The picture above is of the top in the process of being sandwiched. I remember we taped it to my friend's kitchen floor and made a mess of her floor! She ended up having to strip it after much washing which woudn't take the sticky off. I forget what kind of tape we used but obviously it wasn't low tack masking tape. 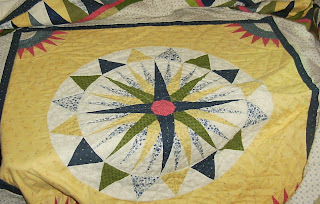 This next picture is of the center part -the Mariner's Compass- that I am hand quilting. Here is our little tribute to the Olympics. Can it be a week since I last posted? I have been busy, and I didn't write because I had no pictures to show. 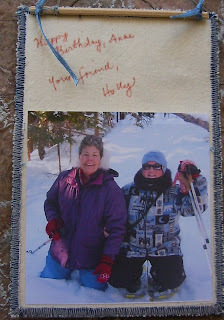 I worked off and on all week to put the finishing touches on a postcard for a swap. It went in the mail today, but I don't think I can picture it here. I will be posting it on the Cloth Paper Scissors(they're hosting the swap) site soon, though. I spent the afternoon walking to Chickadee Junction with my friend; it was just too nice a day to stay inside, and she is leaving in a week for a trip south. 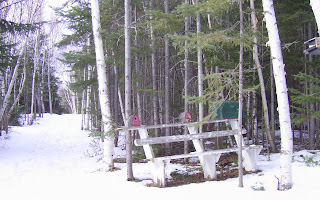 As a result, no new sewing to show, but here is a picture of the place that has been so named by the locals.There is a little cabin there too where bird seed is stored and someone always replenishes the feeders. It's amazing how little snow we have this year. I was told by a former teacher on one of my trips this year that my son helped to make these feeders when he was in shop class in middle school. He is 23 now. I finally got the birthday gift to my friend, so I can post the picture of the postcard that was part of her gift. It is made as mentioned earlier with a layer of torn tissue paper and ephemera glued to a natural cotton base and then painted. 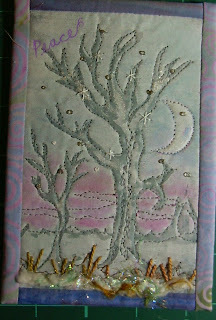 I rubbed with a silver Shiva Painstick for the tree branches. There is a real paper stamp under the chiffon. The Inukshuk symbol is meaningful to my friend, Anne-- she built one at their camp. I also used bits of leftover Angelina fibers that she actually gave to me. 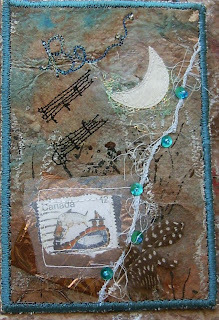 The moon is fused, the music notes free motion stitched. I love doing these little projects! Here is a view of the back. The rest of today I spent finishing up some projects. Once I get near to the end of something and can see what it will look like, I'm often guilty of leaving it at that point. Luckily, I'm not the only one who does that or we wouldn't have invented UFO Days which are such fun. Some of us have more UFO's than others though. I know a certain someone who has way more than me, so I don't feel so bad! I got my little pillow put together, and then I put the lining in the sewing machine cover. I was using it with raw edges on the bottom! all in all, a satisfying day. 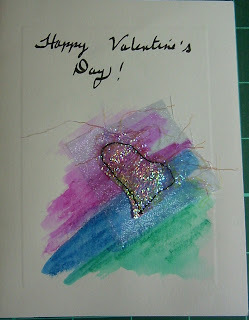 Why buy a card when you can whip one up from scraps and such! And it's such fun! It's just a quick card I needed for a friend. The 'peace' postcard is one that I'm donating to the local art society to raise money for the Red Cross in Haiti. 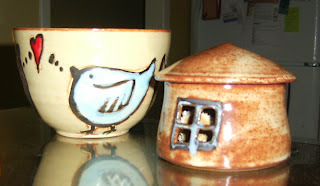 They are having a sale of donated art work at the Zeller's Mall in Bathurst on Sat, Feb 6th. This was my yoga night, so I don't have time to do anything except write this. 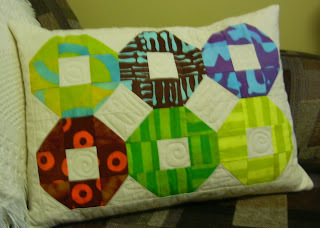 I decided to post a picture of my pillow top with the new borders. Even though I had planned to wait until it was completely finished as a pillow, I changed my mind for lack of anything else to post, and sometimes I am slow to get things done, so it could be a while until it's completely finished, especially if we go skiing this weekend as planned. I took advice from a couple of bloggers and put a neutral border on to repalce the brown one, and it makes such a huge difference. 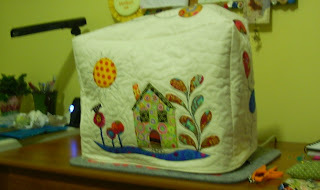 One blogger pointed out that Malka's blocks seem to float and now mine do too! I like it. A friend commented that they remind her of Lifesavers and I must agree; they really do.